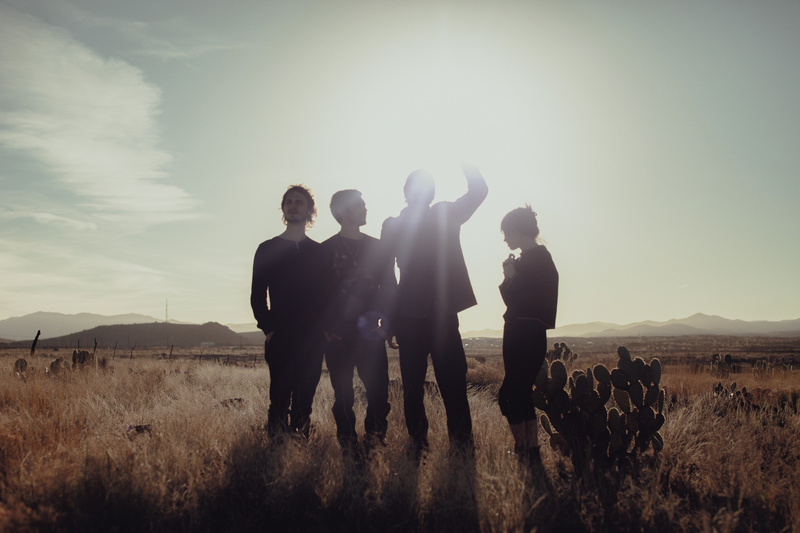 The past few years have been busy for Hundred Waters, a four-piece out of Gainesville, Fla. After forming in late 2011, the group went on to release two full-lengths and two EPs, along with playing spots at multiple festivals and touring the US, UK, and Europe. But in spite of the band’s level of success today, there has been a fair amount of struggle. At the same time, Tetreault admitted that he and the other members—Nicole Miglis, Paul Giese, and Trayer Tryon—didn’t necessarily set out with intentions to get this far, or to accomplish as much as they have. In the beginning, it was primarily about playing music. Hundred Waters’ first album, a self-titled LP, came out in early 2012 on collective label Elestial Sound, but was rereleased in the latter half of the year on OWSLA. That label, which was founded by Skrillex, gave the band exposure to a wider audience, and though the artwork was, according to Tetreault, “refined” in between the two versions, the recordings themselves remained unchanged. When the album came out for the second time, it was not only more official than the first release of it, but also something that finalized things for the band, in the sense that the members felt not only like Hundred Waters had lasting potential, but also that they could move on to the next phase. And once it was out, Hundred Waters was able to refocus its energy on the live show, which seeks to reinterpret the recorded music. He stressed the importance of changing things, not only to continue having fun being creative with the songs, but also to make things more interesting for listeners and audience members. “When we go out and see our favorite bands play, that’s the sort of stuff that, like, takes it to the next level for us,” he said. After Hundred Waters’ album came out, the band was already hard at work on album number two, this year’s “The Moon Rang Like a Bell.” Its beginning stages were, according to Tetreault, put together when the band was on the road, something he attributes to Giese and Tryon, who are good at using that time to create. He also noted that it has been instrumental in inspiring himself and Miglis to also get into writing while on tour. Meanwhile, the album has received positive reviews, in large part because Hundred Waters has done more than simply write a new chapter. Instead, this next step is where the plot thickens, with new elements and new intensity, all the while maintaining a recognizable voice. Or, as Tetreault put it, the songs are more polished and in-tune with what the band is evolving into. Currently, Hundred Waters is on a European tour, which lasts through most of October. Being able to play to a room full of people, and have even just a handful of them feel something, is what Tetreault considers to be one of the best parts of what he does. Hundred Waters plays tonight at Kantine am Berghain in Berlin. The show begins at 20.00. This entry was posted in Interview and tagged American, Feature, Hundred Waters, Interview. Bookmark the permalink.